David Blaine (born: David Blaine White) is an American magician and illusionist. He is known for his close-up and street magic, as well as many outstanding feats of endurance. A never-before-attempted challenge to readers everywhere! Which has been hidden somewhere within the confines of the continental United States of America. Where is it? Who Will find it? This challenge has been created and sponsored by the world’s greatest mystifier . . .
leap to his life below. 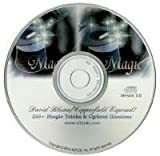 LEARN a multitude of inside SECRETS with which he or she too can mystify anyone.